Home Parenting	Do your kids know where to go in case of fire? Do your kids know where to go in case of fire? This post is part of a sponsorship with the National Fire Protection Association. We were on vacation at Walt Disney World Resort for Oscar’s fall break last week and we had an amazing time playing, celebrating each other, and learning some new things! While there we had a chance to check out Innoventions at Epcot, which included a fire safety exhibit. It was great timing as it was fire safety week and my boys had a chance to learn about what to do in case of a fire in the home. If you are a parent, you know it takes many times teaching the same thing for a child to really understand it. Both children have seen fire trucks before and Oscar has even toured a fire station locally, but consistent little reminders every once in a while go a long way in keeping kids safe during an emergency. Meet Sparky the Fire Dog! Of course it doesn’t take a visit to a major theme park or even the local fire station to learn fire safety and prevention. 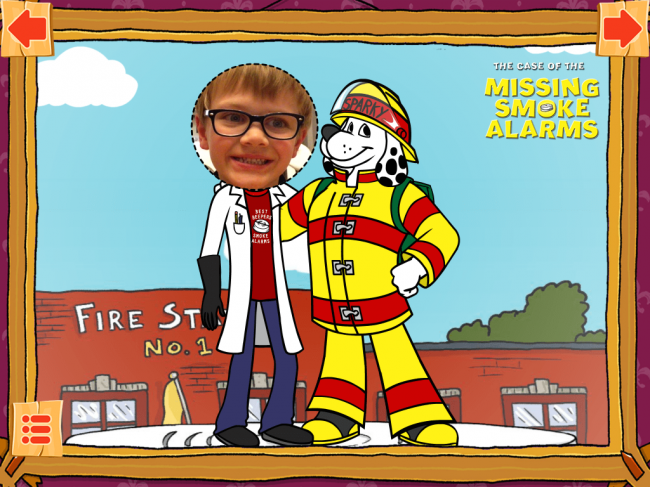 If you are looking for a fun way to get a great message to your kids, check out Sparky and the Case of the Missing Smoke Alarms, a free app available on iTunes and Google Play! In this interactive story book, kids will solve the mystery of the missing smoke alarms and learn about what to do in case an alarm goes off or in case of a fire. As we read through the story, our boys learned to leave the home immediately in case of fire and to go straight to our meeting place. We realized we had never designated a meeting place so now we all know to go right to our giant Magnolia tree in the front yard during an emergency. We also know it’s time to change our smoke detectors at home. We change the batteries regularly, but did you know even the actual smoke detector needs to be replaced every ten years? How old are your smoke detectors? I can’t even answer that question. Throughout the book, kids have the opportunity to find fire safety clues. At the end of the story, the child is rewarded with a fun certificate celebrating his or her achievement. Oscar loved typing in his own name! 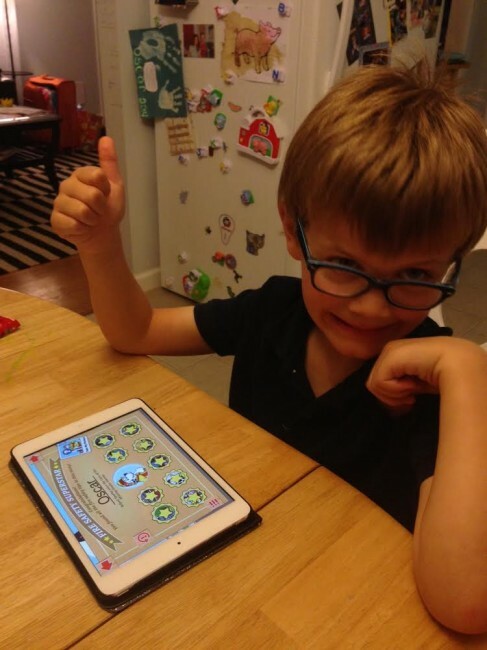 I love that the app also includes games for children to continue playing even after they solve the mystery. It can be hard to think about preparing for an emergency, but apps like this one and others from Sparky the Fire Dog are great for getting the whole family involved in creating a plan for the unknown. 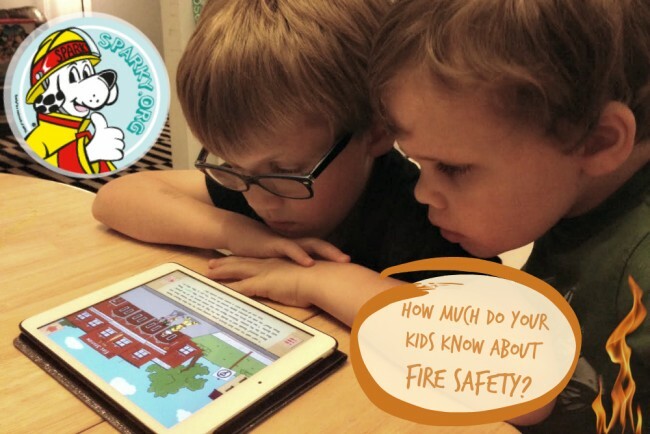 Check out Sparky and The Case of the Missing Smoke Alarms along with other stories and resources on fire prevention at Sparky Schoolhouse! Do you have a fire emergency plan in your home? Where is your family’s meeting place? My girls just asked this week where we should meet. I said at the bus stop (I think) it’s right across the street. They also said they want a ladder to get out of their room! Oh we should get a ladder too! Good call.